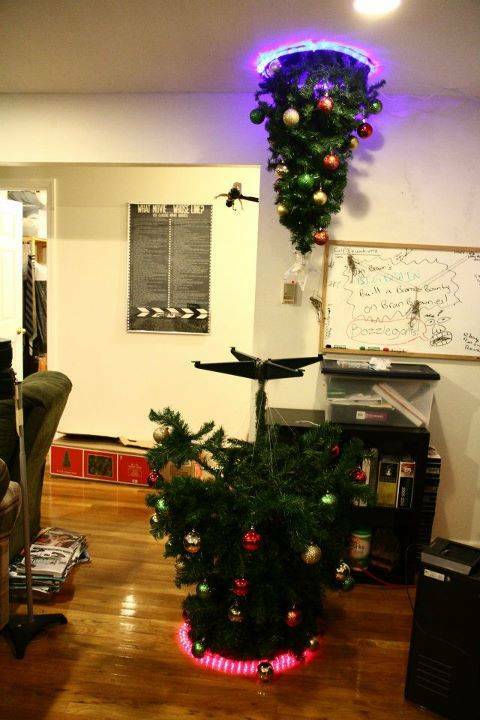 Rue The Day!A Portal Christmas Tree - Rue The Day! Basically, it’s our artificial tree which comes apart in three sections. The top section is suspended from the ceiling by an adhesive hook so it simply hangs downwards. The other two sections are connected and placed upside down on the floor – the tricky part is that the branches are meant to be kept extended out by gravity, so there is fishing line attached between each branch and what is usually the base of the tree, pulling the branches up towards the ceiling. While it looks cool, it seems like it might get in the way since it takes up so much space.